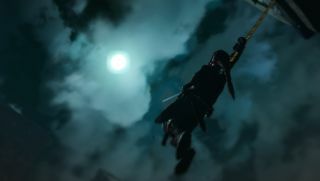 The new project in the works at Frozenbyte, the studio that gave us Shadowgrounds and Trine, is a "true stealth game" called Shadwen, in which the only rule is to remain unseen. And maybe kill a few dudes. Or, you know, a whole bunch of dudes. Hey, omelets and eggs, right? Dude-killing, after all, is your profession. But your mission to assassinate the king runs into a snag after you encounter an orphaned little girl who insists on following you around. She'll bear witness to everything you do, and that poses a question: Will you expose her to brutality and murder, or will you protect her innocence and find another way through? "The stealth genre has been in a slump for years. Guns blazing and invincible heroes is not stealth," Frozenbyte CEO Lauri Hyvärinen said. "Shadwen will bring the genre back to its roots, with sneaking and hiding [as] the main course of action. We will also explore the moral consequences of killing through our characters." Shadwen will feature time manipulation, allowing the assassin to halt and even rewind time to gain an upper hand against otherwise overpowered guards. Objects can be dragged and toppled, traps can be set, and some murders can even be made to look like accidents. Or you can embrace the true mastery of stealth and finish the game with no blood on your hands at all. Time manipulation notwithstanding, it all sounds very old school, like those great Thief levels that slapped you in the face with a failure if you offed even one single guy. That's legitimately exciting stuff. More information about the game is up at Shadwen.com and we've also got the trailer and some screens below, all taken from a pre-alpha build of the game. Shadwen is expected to be ready for release sometime in 2016.